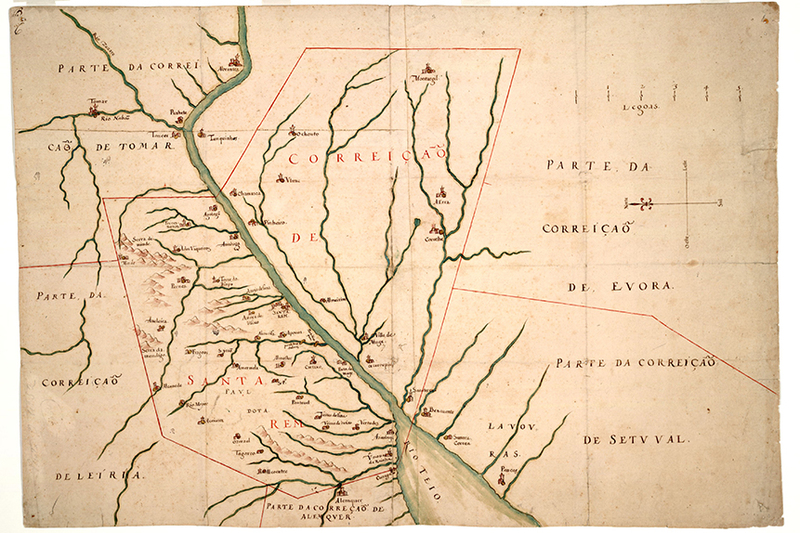 Correição de Santarém, 1640. João Teixeira Albernaz. National Library of Portugal. 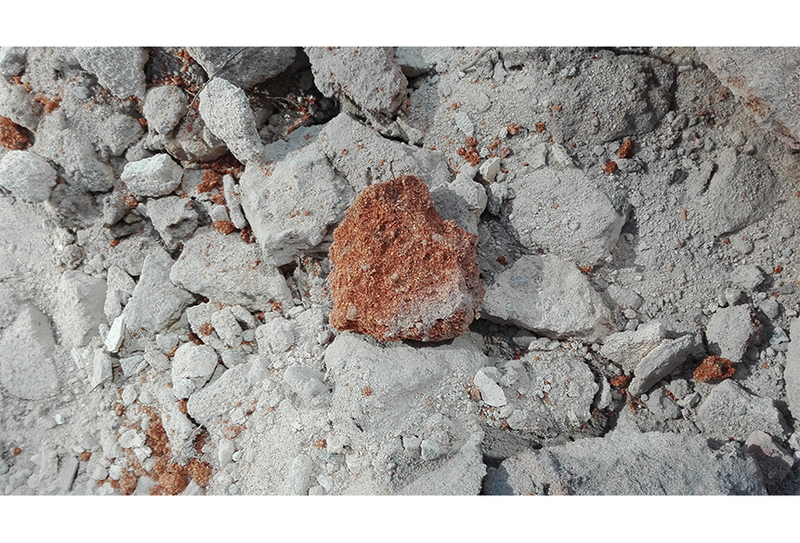 Extract of the "Planta do rio Tejo, desde o Mouchão dos Coelhos até ao extremo do Dique de Vallada, folha 6". M. J. Júlio Guerra. National Library of Brazil. 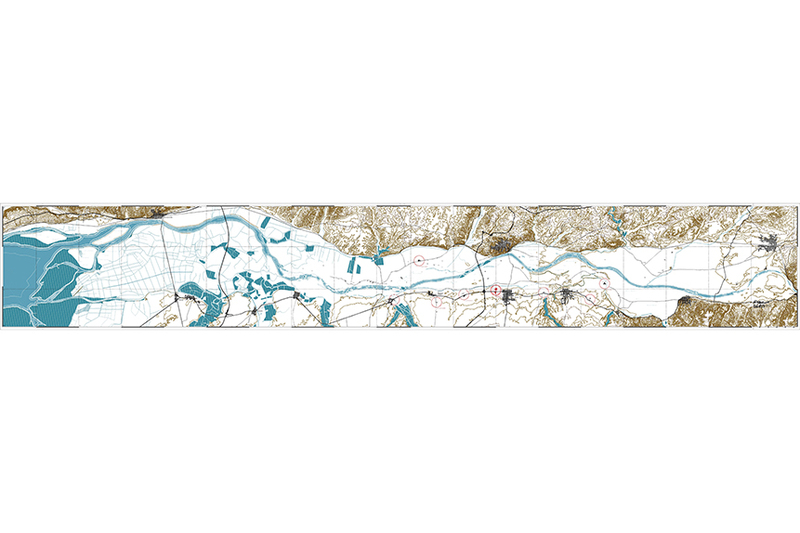 Landscape drawing of the low and medium Tejo basin topography and water lines. 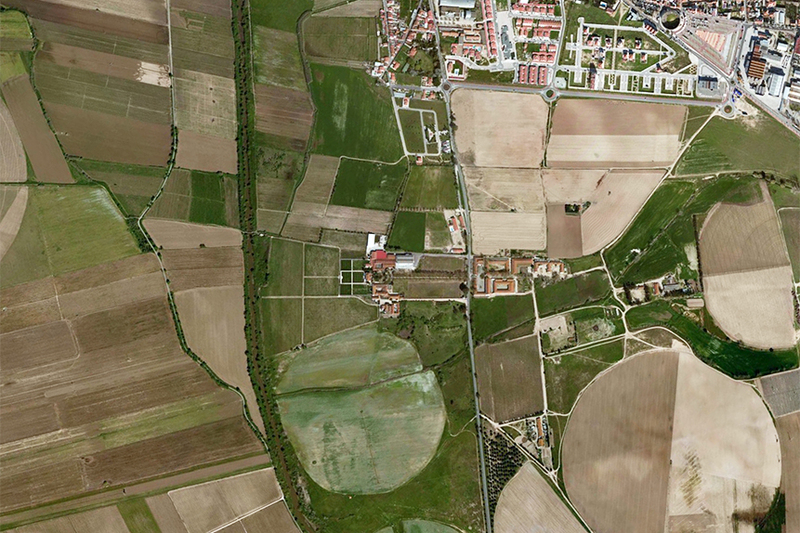 From right to left: alluvial plain, channel, vineyards, Garden of the Marquis of Alorna, the Palace, Garden of the Viscountess of Junqueira, the promenade, the main road. Overall view of the finished Jardim da Viscondessa. 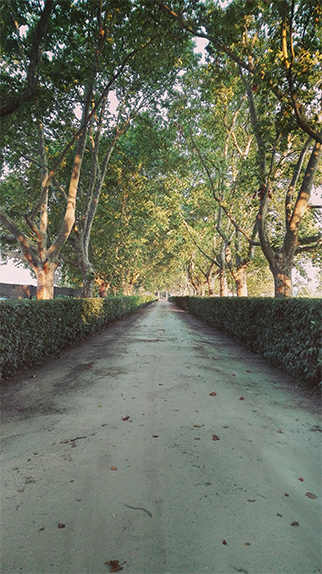 Main alameda of plane trees. Presence of former water-bound pavement. 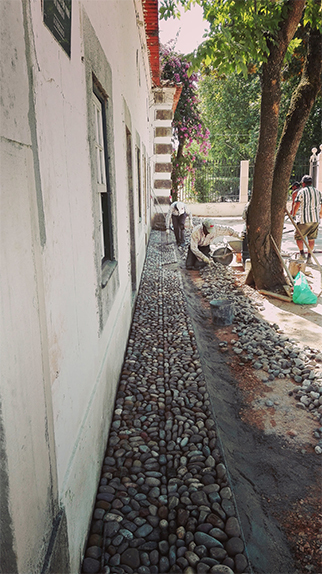 Rehabilitation of linear drainage with local river pebbles. Overall view of the Jardim da Viscondessa. Fountain. Overall view of the Jardim da Viscondessa. The Quinta da Alorna is a property of aproximatly 2800ha, of which about 1900ha are occupied by forest, another 220ha occupied by vineyards, and the remain dedicated to diverse cultures. 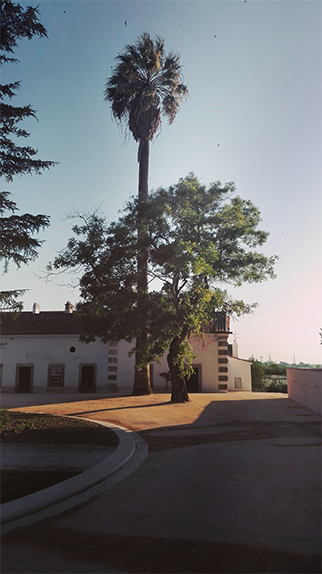 The estate and the Quinta da Alorna form a rural body typical of the Unit of Landscape to which it belongs – “Lezírias do Vale do Tejo“. 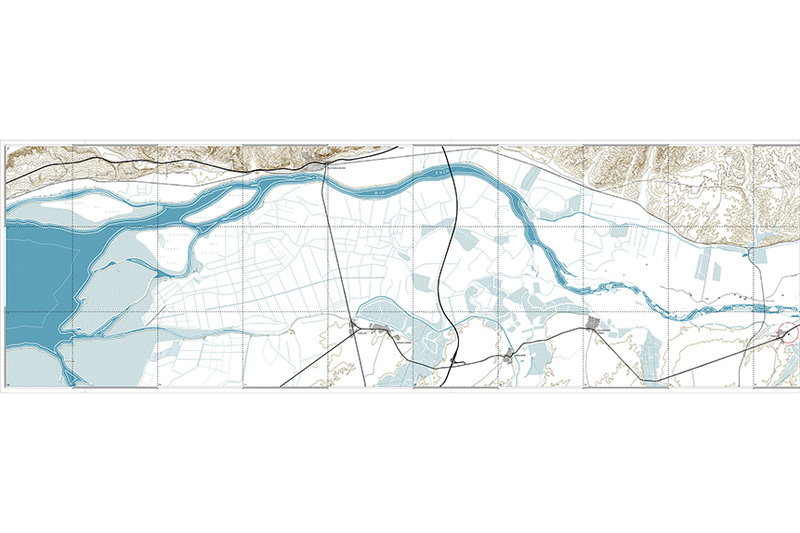 The territorial organization of the Quinta follows the prodution possibilities set forth by the rapid and slow movements of the river. 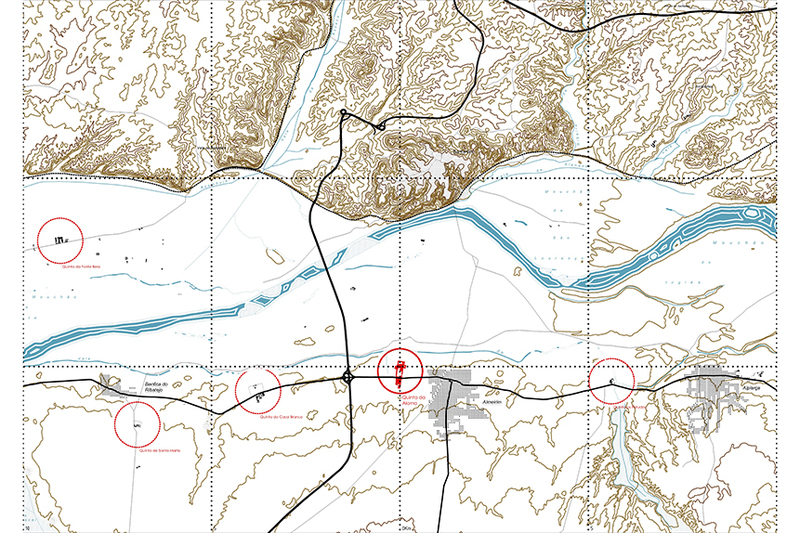 If the right bank of the river is caracterized by the slow erosion of lime hills and sharp ravines, ponctuated by human occupations that take the best of the their geographical positions, the left bank extends southward on another scale. 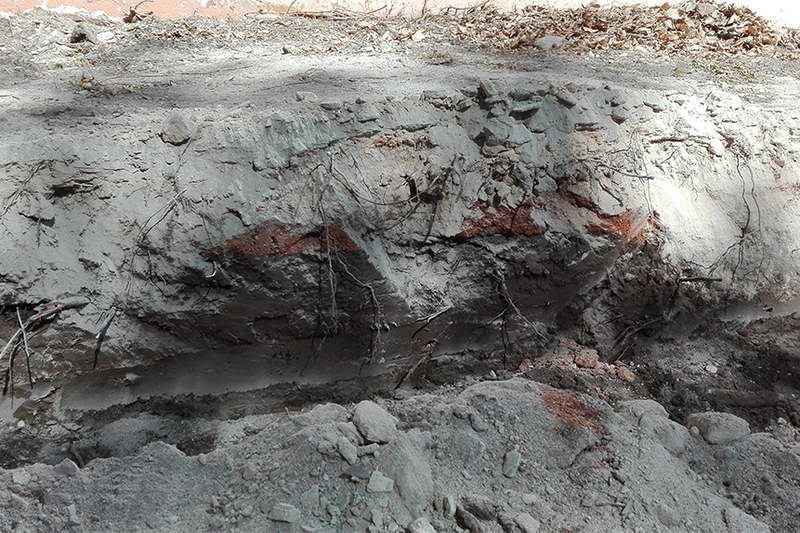 Characterized by flat plains, divided by almost parallel water lines flowing north to the Tejo river, its geology tells a chronologic story of river floods and deposits – the proximity to the river and the relative elavation dictating the age of each deposit. 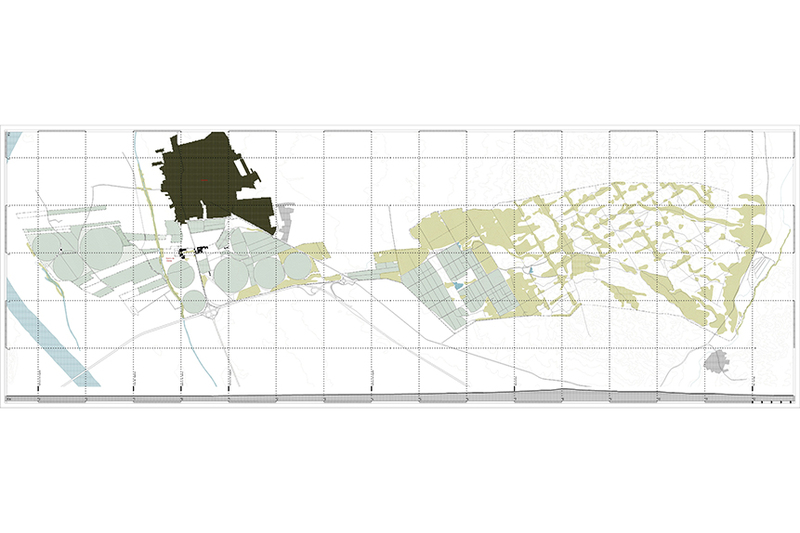 In each ridge formed by consecutive waterlines, human settlements have thrived. 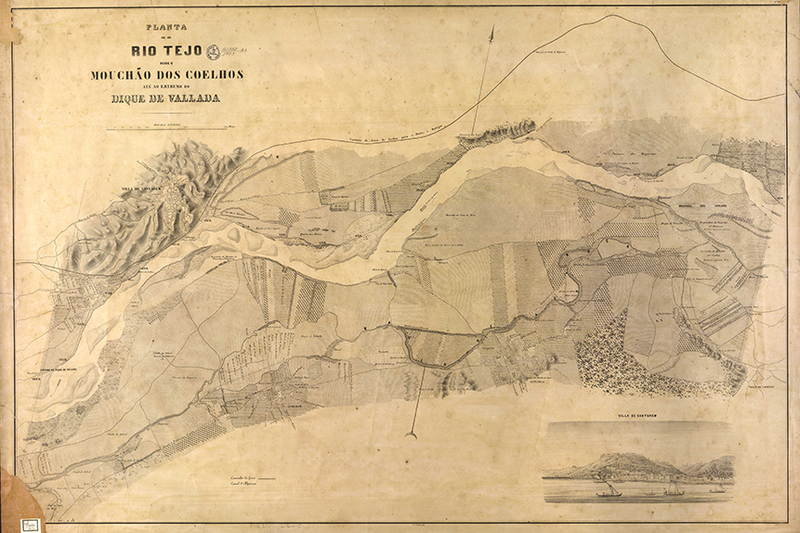 Running northeast to southwest, the Tejo floods its large alluvial plain. The Quinta naturally extends from the river to inland, with its form and agricultural occupation translating the geological history of this landsapce: in its lower banks on the contemporary allovial plain, a pathwork of geometric agricoltural fields are ploughed for their richness in organic matter and water; the first series of river deposits are divided in a system of vineyards and other cultures; and inland, at higher altitudes and on older deposits, a larger patch of forestal production constitutes the larger part of the property. 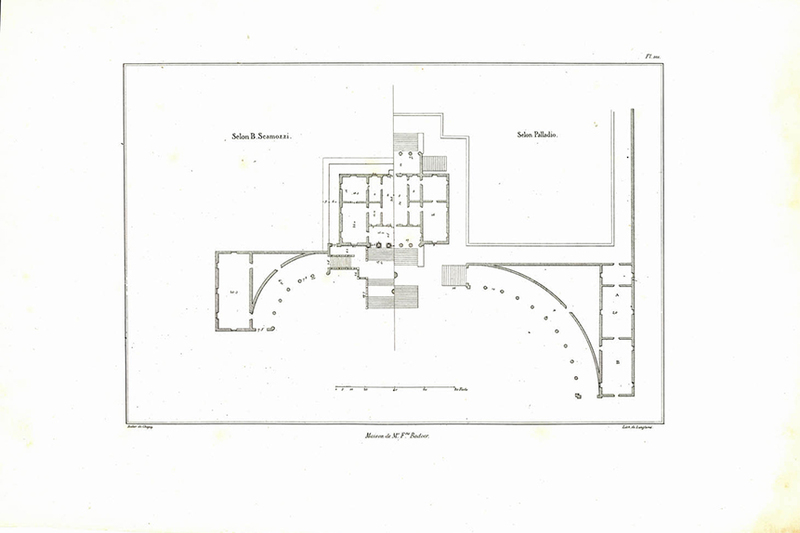 As it is typical of the architecture of the villas in this valley, the palace as its ortogonal relation with the river mediated by specific architectural elements: windows and loggias are set high above the alluvial plain on top of a geometrical platform accessible by a pair of opposite staircases; inside, a symetrical plan sets larger communal spaces overlooking the landscape, a corridor links both façades. 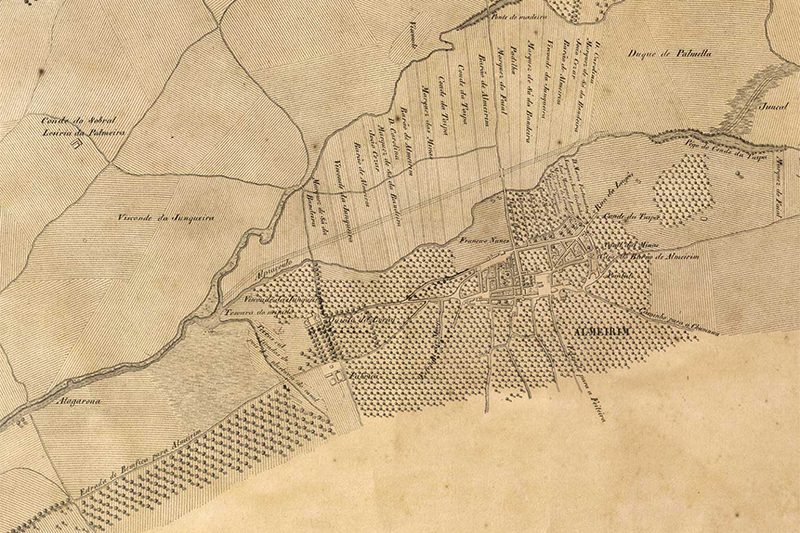 As a central place of manegment of the estate, the Quinta is localized along a National Road that, running across the left bank of the Tejo river, serves a group of populated centers and estates. This road, of regional importance, has equally served as the basis of development of a system of large agricultural estates to which this Quinta belongs and has corresponded to the establishment of a combined program of leisure and production. In this sense, the group of large estates that established on the left bank have centered their manegment around the Quinta de Recreio (Quinta of Leisure). 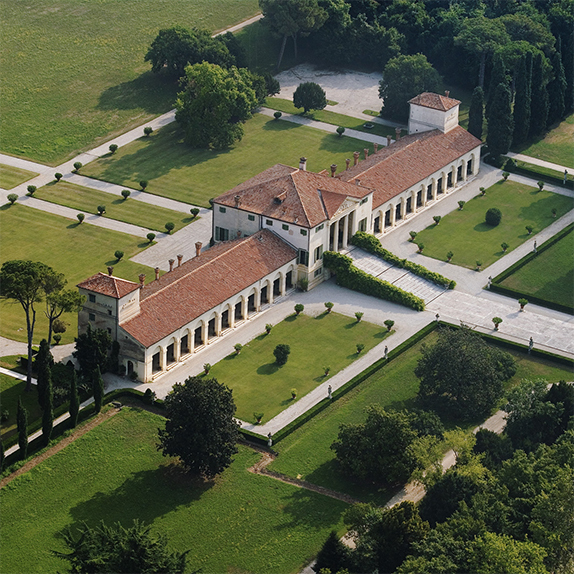 In this organization scheme, the program of leisure more associated with the main house or palace is localized on the west side of the road, and thus establishing a deep relation with the lezíria and the river, and the agricultural program with its center around the office, warehouse, stables and riding yards is localized on the east side of the road. 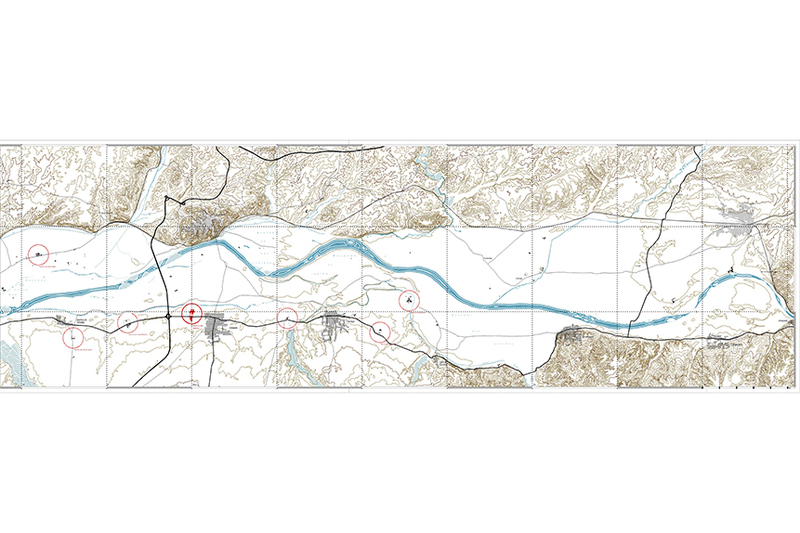 This typology for landscape organization applies to the Alorna and to other Quintas along the left river bank, conforming a cultural pattern for organizing the landscape of the lezíria that is of interest to identify and explore. In this sense the contemporary establishment of a industrial complex of wine making and corresponding logistics constitutes a transgretion to this principle eventually manifested on other estates. 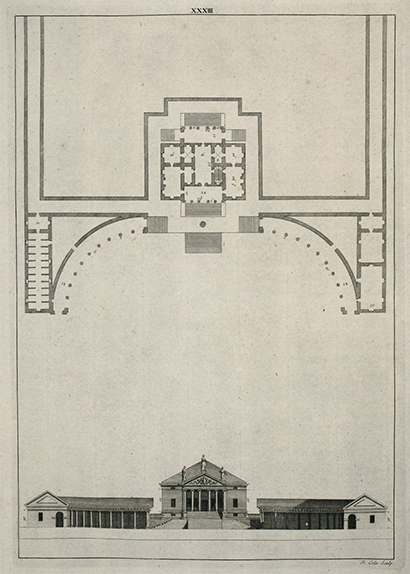 The program of leisure follows a succession of walled spaces: crossing the main gate a promenade of plane trees cross a ampelographic field connecting the gate of the walled Garden of the Viscountess of Junqueira; facing this garden the elevated palace distributes an architectural program on both sides, overlooking the Garden of the Marquis de Alorna to the west, with the river beyond, its ravines and sky. The vocation for leisure the Quinta currently posesses is natural and comes from its foundation. 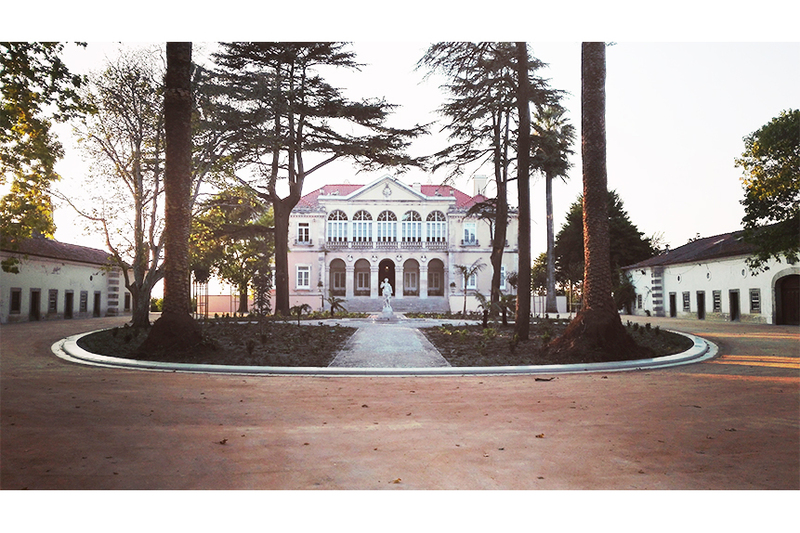 The character of the Quinta de Recreio, commom between the several Quintas along the road, constitutes itself as a phenomenom of the Cultural Landscape not yet fully studied and understood, though posessing a cultural and economic potencial relevant for its regional specificity and for its potential for sinergetic effects. 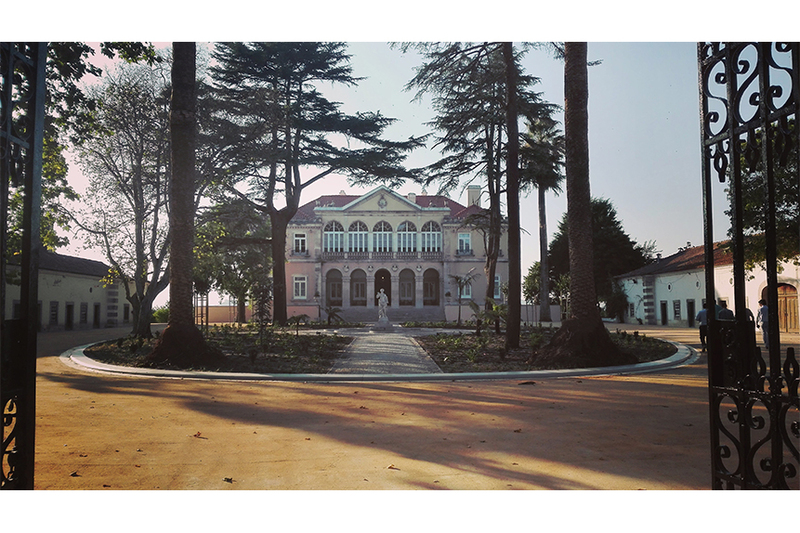 The Quinta da Alorna already uses on a complementay mode the value of leisure for promotion of its economical activity, founding the identity of this space in this value. 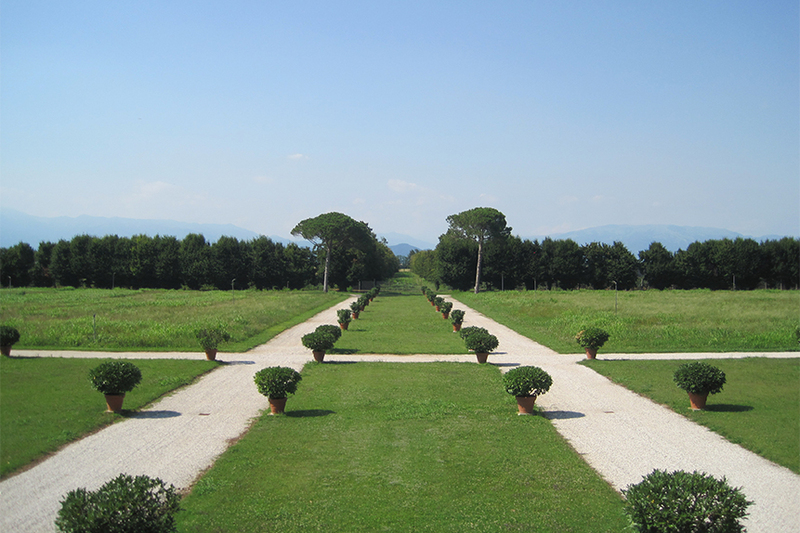 In this sense, the former rehabilitation of the Garden of the Marquis de Alorna – the walled garden facing the river, marqued by its ortogonal paths and linear water tank, much in line with the palladian architectural plan of the palace – iniciataded a process of valorization of both the Palace and Estate, now propagating on the opposite space designated as Garden of the Viscountess of Junqueira, and the walled space of the estate based upon a system of acesses for workers and visitors and the the rehabitlitation of its ampelographic field – the living collection of vines used by the estate for the production of wine. The rehabilitation of the Garden of the Viscountess of Junqueira begins with the recognition of the existence of a system of four paved paths intersecting on the central tank and its sculpture, taking into account the findings of former elements revealed by construction: a former waterbound yard, presence of pairs of gutters formed by peabbles and runing along intersecting paths. Its delimitation with a finishing element of eliptic form allows for the distinction of the garden from the surrounding yard. The last makes it possible for the circulation of vehicules, allowing the drop off and on of passengers on the main staircase facing the palace, while not permiting permenent parking. 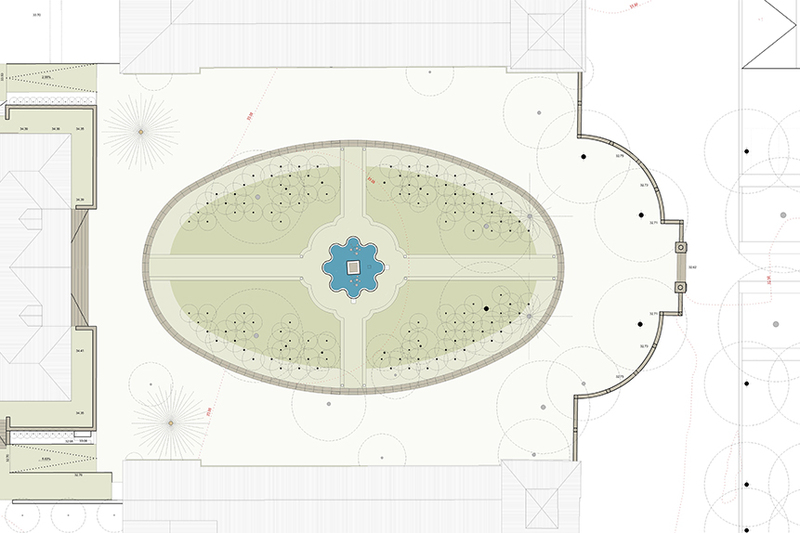 The garden corresponds to the eliptic figure crossed by four ortogonal paths and filled with a vegetation structure of heterogenous volume closing on its periphery and opening around its center. These openings allow for a fixe and broad vision of the palace from the entrance gate. 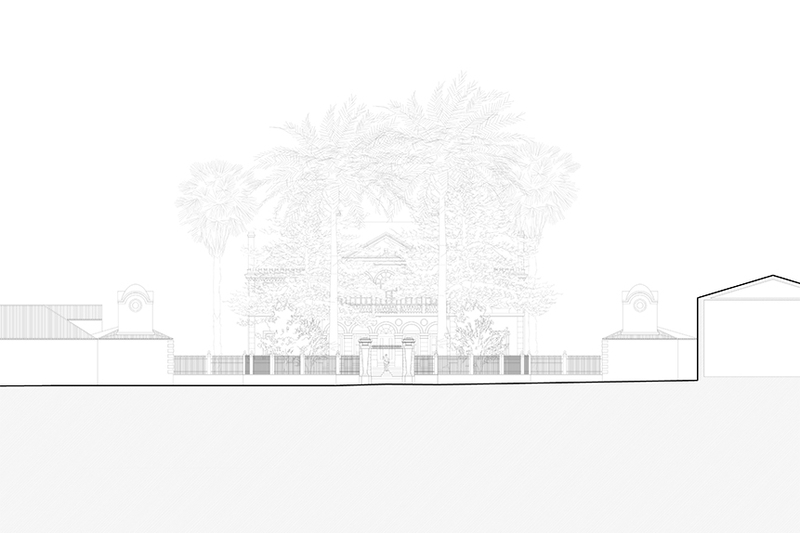 The conservation of specimens of greater size (palms and cedars) is combined both with the progressive substituition of medium sized and poor health specimens (black cherry plums, japonese pagoda trees and acacia trees), and with the perimetral plantation of other trees (a missing cedar, and a system of cherry plums), shrubs, tree ferns and palms (all sciophytic species), all of which reflecting the still present XIX century exotic character of this space. 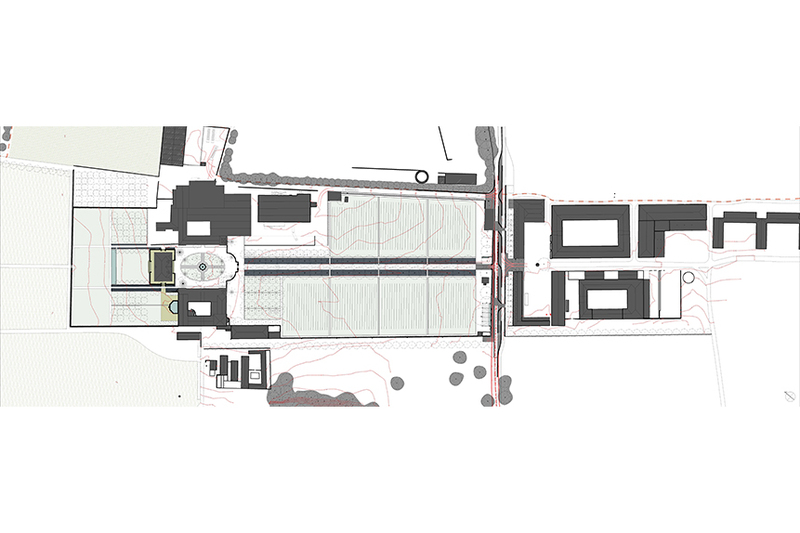 The recognition of both form and matter of the former garden informed the use of construction processes and matters. 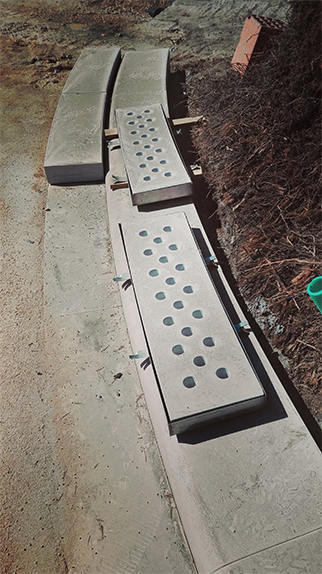 The findings of former paths and gutters were used as a bearing for the project, using locally collected peables – the matter of the river bed – for the repavment of paths and hidraulic elements. The remaining yard was again repaved with an water bound pavement. 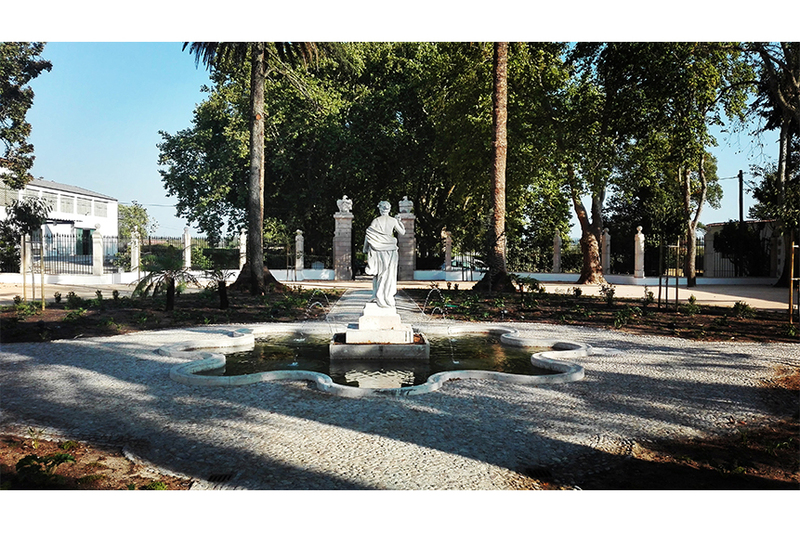 The connection between gardens restored; gate, fountain and statue rehabilitated.